Whether you are thinking about selling your home or you simply want to improve the look of your home’s exterior, installing wood garage doors is a great way to increase the value of a property and provide an aesthetic accent that won’t go unnoticed. When you replace the old, creaking doors of your garage with a unique set of garage doors, you will immediately see the effect a quality set of these components can have upon a home. 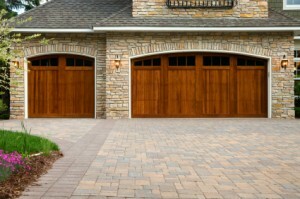 Not only will the perceived value of your property rise, but you will also enjoy the new look afforded to your garage. Understanding the positive effects that a set of wood garage doors can have on your property is one thing, but installation and system configuration is quite another. It is important that you utilize the services of trained professionals in order to integrate new doors into your garage. At Action Garage Door, we will meet all of your Fort Worth new garage needs. We can provide all the service options you require in order to bring new life to the front of your home. At Action Garage Door, we pride ourselves in carrying a wide variety of products to meet the needs of our customers. There are many trims and finishes to choose from, but our team of trained professionals can help you to decide which wood garage doors best fit you, your home, and your situation. We strive to perform our services with the highest possible degree of quality. Contact us today at 972-254-4040.